NEW YORK, Dec. 5, 2018 /PRNewswire/ -- Columbia scientists have identified a brain region that helps tell an animal when to attack an intruder and when to accept it into its home. 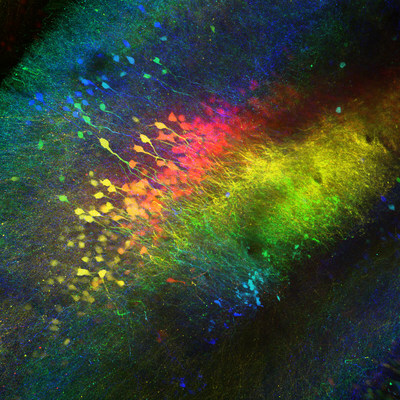 This brain area, called CA2, is part of the hippocampus, a larger brain structure known to be critical for our memory of people, places, things and events. CA2 was already known to specialize in social memory, the ability to remember encounters with others. Surprisingly, today's findings reveal that a single brain region can control both higher-order cognition, like social memory, and an innate, instinctual behavior like social aggression. And because CA2 dysfunction has been implicated in psychiatric diseases, such as schizophrenia and bipolar disorder, these results provide further support that altered CA2 function may contribute to abnormal social behaviors associated with such illnesses. "Today's study in mice shows us that diminutive CA2, which is made up of just a few thousand cells, acts as a nexus of social behaviors, allowing memory to influence the decision to engage in social aggression," he continued. "It appears that, at the beginning of a social interaction — such as when the resident mouse meets an intruder — the animal's CA2 forms a social memory, a sort of social ID tag, of the other mouse," Dr. Leroy continued. "Further along in the interaction between the two mice, a signal generated in CA2 is sent to the lateral septum, which facilitates aggressive behavior." "We found that the ability of CA2 cells to efficiently activate the lateral septum is greatly enhanced when vasopressin is released in the lateral septum," said Dr. Siegelbaum. "Previous research had revealed a link between vasopressin and aggression, and CA2 appears to lie at the center of this effect." "People with schizophrenia exhibit a wide range of behavioral alterations, including impaired social memory and altered levels of aggression," said Dr. Siegelbaum. "Might this result from a loss or change in CA2 activity? And could these deficits be alleviated by artificially boosting CA2 activity? That is something that our research, and that of others, hopes to reveal." This paper is titled "A hippocampal CA2 to lateral septal circuit disinhibits social aggression." Additional contributors include Jung Park, Arun Asok, PhD, David H. Brann, Torcato Meira, Lara Boyle, Eric W. Buss, PhD, and Eric R. Kandel, MD. This research was supported by the National Institutes of Health (R01 MH104602-01, R01-MH106629), the Portuguese Foundation for Science and Technology and the Howard Hughes Medical Institute.